The TOTO Vespin II Washlet+ C200 toilet and bidet system offers function and quality along with a streamlined design that will look great in any bathroom. The Vespin II toilet features TOTO’s forceful Tornado Flush System, ultra-smooth CeFiONtect bowl glaze, and a generous 1.28 gallon flush that work together to keep unsightly residue build-up at bay. 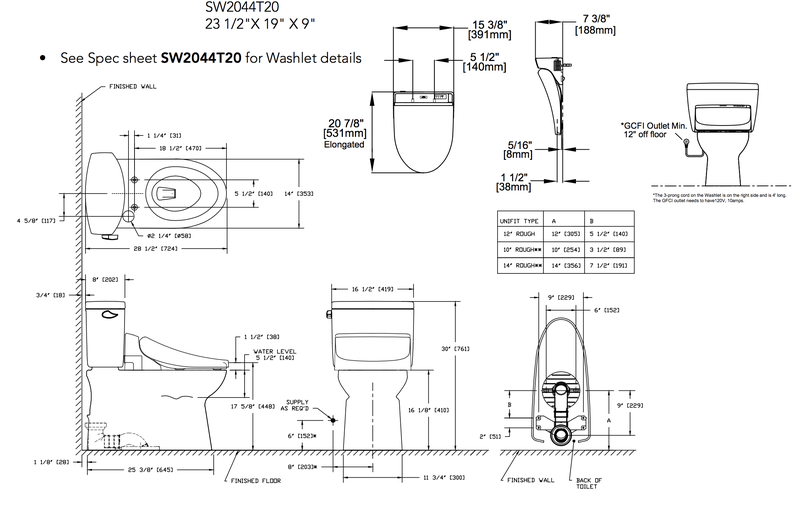 In addition, the toilet is a universal height, making it ADA compliant, and its sleek, skirted design not only looks stylish but also makes cleaning easy. The Vespin II is one of TOTO’s Washlet+ toilets, meaning it’s been specially engineered to hide the C200 Washlet+’s cords and hoses from view for a supremely streamlined silhouette. The C200 Washlet+ is a high-quality unit with features designed to enhance user comfort and convenience. The seat features a tank water heating system along with adjustable water temperature, water pressure and wand position, and three wash modes—front, rear and soft rear—provide thorough cleansing. Do note that tank water heating systems keep a limited amount of warm water on hand at any given time, so if the warm water in the tank runs out, the seat switches to using room temperature water for a few minutes, until the tank can refill and reheat. The C200 features two additional spray options, pulsate and oscillate, for additional user comfort. The pulsating spray alternates the water pressure to create a soothing massage that stimulates the bowels, while the oscillating spray moves the wand back and forth for increased wash coverage and relaxation. The bidet’s seat is heated, and the unit features a warm air dryer that can reduce or eliminate your reliance on costly and abrasive toilet paper. In addition, the automatic deodorizer prevents odors from taking over your bathroom, and the energy saving mode conserves electricity when the seat is not in use. Finally, the C200 Washlet+ is operated via a wireless remote that comes with two user presets that allow you to program your preferred settings into the remote for a customized, one button wash and dry. With so many amazing features, you’ll be adding both style and luxury to your bathroom with the TOTO Vespin II Washlet+ C200 toilet and bidet system.